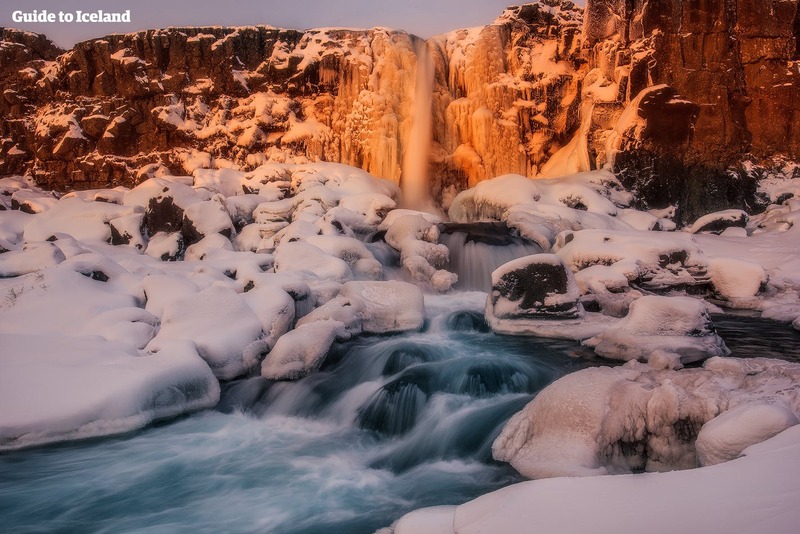 Get to know Iceland with a private tour of the Golden Circle where you’ll see spectacular nature, erupting geyser and a magnificent waterfall. Those wanting to travel at their own pace, as well as tailor a tour to their own interest, need look no further than this tour. You’ll be picked up at your Reykjavík accommodations in the morning by a luxurious vehicle that will whisk you out of the city to your first adventure. If you are arriving in the country via cruise ship, you can also be picked up at Reykjavík harbour’s cruise ship port. Your first stop of the day is Þingvellir National Park, the birthplace of Iceland’s parliament. It is here where Viking settlers would gather to create the laws of the land and settle disputes. Þingvellir’s geology is also fascinating as the park is not located on the Eurasian nor the North American tectonic plate, but in a rift valley between. The shifting of the plates causes visible cracks and canyons in the region, some of which are filled with crystal clear meltwater from a nearby glacier. Next up is another historical location, Skálholt church. From 1056 until 1785, Skálholt was Iceland’s cultural and political centre. Today, the region is famed for a beautiful cathedral, the tomb of bishops, a museum, and a 13th Century tunnel which leads out to an excavation site. 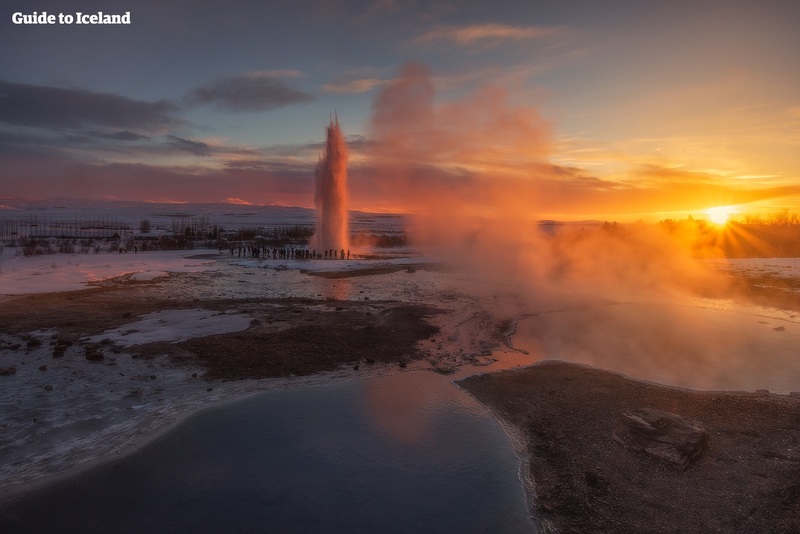 From there, you’ll visit the erupting geysers at Geysir geothermal area. There, you’ll see the mighty Strokkur erupt every 5-10 minutes, reaching heights of around 15-20 metres. So remember to bring your camera as a selfie with an erupting geyser is a must in Iceland! The area is also filled with bubbling mud pools and hot springs which you’ll be able to explore to your heart’s desire. Last, but certainly not least, is ‘the golden waterfall’ Gullfoss. It is here where beauty and power meet as freezing water from the glacier Langjökull rushes forth before plummeting into an ancient canyon, creating this two-tiered cascade in the process. Experience the best of Iceland with this private tour of the Golden Circle. Check availability by choosing a date. Skálholt is a historical site and an ancient bishop seat in South Iceland. From 1056 to 1785 Skálholt was one of two episcopal seats in Iceland, the other being Hólar in the North. They were the two most important cultural and political centres in Iceland, beside Þingvellir where the National Assembly was held. In the Middle Ages, Skálholt featured a monastery, a cathedral, a school, dormitories and a smithy, and was surrounded by many farms. The country was Catholic until the Reformation, which ended in blood at Skálholtl the last Catholic bishop, Jón Arason, was beheaded here with his two sons in 1550. The school founded here, Skálholtsskoli, was the first official school in the country, and the current Reykjavik Gymnasium (‘MR’) in Reykjavík has its roots in this old establishment. Skálholt today has an ordaining bishop. it features a large evangelical Lutheran church, Skálholt Cathedral, which was built between 1956 and 1963. Skálholt also serves as an education and information center of the Church of Iceland. The town is a popular tourist destination and hosts many cultural events, such as concerts, the most prominent of these being the July summer concerts programme featuring classical musicians, choirs and more. In 1954, during an archaeological excavation a sarcophagus was found, which was believed to contain the bones of Páll Jónsson, one of Skálholt's most powerful bishops. These are on display along with other relics found at the site in an underground vault beneath the memorial church. At the vault are also two other Icelandic tombstones and a number of ones of foreign bishops and a governor. Within the church you may also find relics from an earlier church that was built at the site in the 17th Century. The church tower contains ancient books and among the eight church bells is a small one that dates from the middle ages that still retains a beautiful and clear tone. In short, tourists interested in history, religion, archaeology, culture and classical music will all find entertainment at Skálholt. Pick-up starts 15 minutes before departure of the tour. Please be ready at your pick-up location. This gives you the total cost of the tour in the booking selection. We return at least 1 hour before Cruise Ships departure time, if needed. During the tour we break for refreshments at a local restaurant or café. Due to weather and/or road conditions we might have to alter the itinerary, have longer journey time or cancellation of the tour.